Director Jewels: Christmastime is here......wait, what?!!!?! Well, the show is done. It was a great success, with crowds who seemed to enjoy the magic we created on stage. What more could we ask for? This leaves me with the realization that it's just 8 days until Christmas...and I haven't really purchased any gifts. This is indeed, a bit frightening!! I'm trying to do some online shopping, but I haven't even had time to think about what to get for anyone...so I don't know what to do. I'm hoping inspiration will dawn before it is too late. 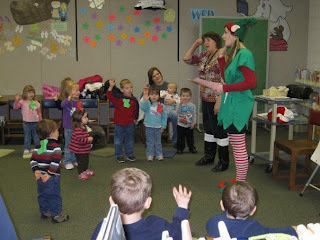 You really haven't lived until you've volunteered to play the Storytime Christmas Elf at the library the week before Christmas. I have done 5 appearances as this happy character, with 2 more planned by Friday's end. 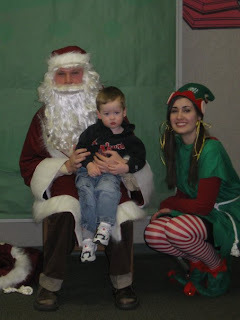 I also organized for Santa Claus himself (who happens to have been the star of our Christmas production and also happens to already work for MCPL) to make an appearance. Most of the very small children were terrified, but a few were brave enough to pose for a photo. Note: it's not a good idea to buy elf shoes on eBay. You'll wear them for about 5 minutes, they will suddenly have massive holes and you won't be able to keep them on your feet...and then you'll have to spend your free time at home making a new pair for the rest of the week. Just make sure you've had lots of practice making Knook shoes (like....10 pairs) for a community theatre show. Then you'll be done in a snap! well, it's been awhile (again).